If you have bats in the roof, you can neither harm the bats nor their roost in your home. Bats are a protected species within the UK. All species are protected by the Wildlife and Countryside Act 1981 and The Conservation Regulations dated 1994. 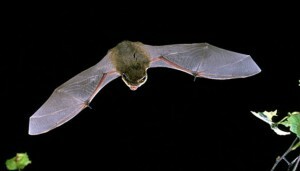 If you suspect that they are roosting in your property, even if they’re not there currently, then you should seek the advice of a professional such as the Bat Conservation Trust or a local Statutory Nature Conservation agency – you’ll be able to find your nearest one through a simple search of the internet. Bats often come and go from your property without you even noticing. You may only realise that you have them when you start undertaking roof repairs or you have cause to check your roof. Originally bats roosted in trees and caves but as densely wooded areas have gradually disappeared, they now have to find a home in buildings. Bats do not favour old buildings, as many people may believe – they like modern buildings too, and they may settle in the roof space or behind fascias or even in your cellar. They are not present all year around but when they do choose an appropriate space in which to roost, bats will often return to the same place year after year, when they are hibernating in the winter months. You must not meddle with a bat’s roost, whether they are there are not. If you need to carry out maintenance work on your roof or even trees where bats are known to roost, make sure you contact a registered nature conservation agency for advice before you contact a roofer. These creatures will not cause you any problems. Many property owners have bats without realising that they’re there. In the UK, bats are small in size and grow only to around 3 ¼ inches long at the most. They actually prefer to roost in a clean space and spend most of their time cleaning themselves. They present no harm to your property – even their droppings are harmless and odour free, and will soon disintegrate into dust. You’ll never find dead prey inside the house because these creatures don’t bring insects into their roosts. They will not harm your wiring, wood or insulation and don’t build nests, so you won’t find debris lying around. And you don’t have to worry about a massive infestation either, as the females only produce one baby a year. If you have bats in your roof, you will not usually notice them as they are active mostly at night-time and tend to confine themselves to minute spaces under your felt roofing or in crevices. If you do spot a bat, contact a conservation agency or your local bat group. There are many bat groups in existence in the UK, who monitor and work to preserve this protected species. There are currently 90 such groups, and they will be able to visit your premises and document what type of bat is living there for conservation purposes. 1) If you need to carry out roofing work such as roof repairs, roof replacements or maintenance work around or near the roost, you must contact a conservation agency before you call a roofer. You should still be able to undertake your roofing work but without advice from a qualified agency you may be breaking the law. 2) It is illegal to handle a bat unless you are licensed to do so. 3) You must not prevent a bat from roosting in your property or deny them access. 4) You cannot destroy or damage a bat roost. If you need roof repairs, roof replacement or other roof maintenance work, contact G&A Roofing and Building to speak to a professional roofer. We also offer emergency roof repairs. We are a reputable roofing company that deals with all aspects of roofing work for homes and businesses. We offer a superior service and our trained roofers will respect your property and your environment, providing a service that’s both efficient and affordable. Call G&A Roofing and Building to speak to a roofer today on 0800 626430.